To make the sauce: Combine all ingredients for the sauce in a medium saucepan over medium-low heat. Stir 5 minutes until chocolate chips are melted and sauce is smooth. Remove from heat; cool slightly to thicken. 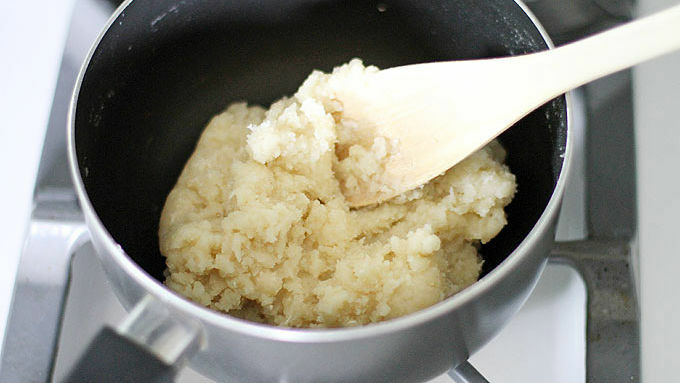 To make the churros: In a small saucepan over medium heat, bring sugar, salt, water and 2 tablespoons of oil to a boil. Remove from heat. Add flour and stir with a wooden spoon until a soft ball of dough forms. Transfer dough to a piping bag fitted with a large star tip. Meanwhile, fill a large saucepan halfway with oil and heat over medium-high heat to 375°F. 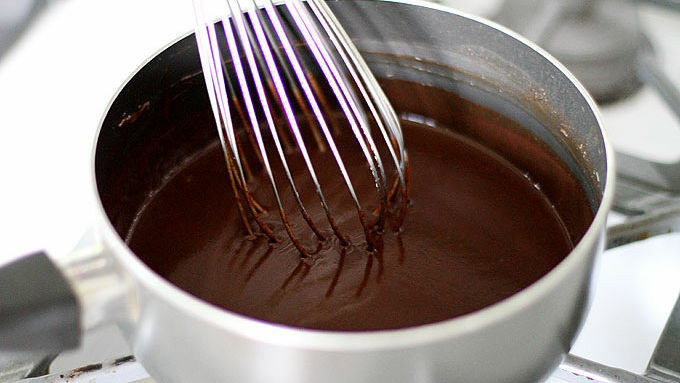 Carefully pipe churro batter into oil (or pipe onto a plate, then transfer to oil using a slotted spoon). 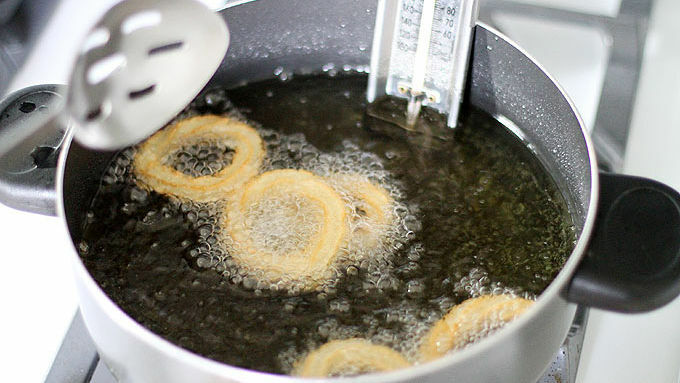 Fry churros on both sides 1 to 2 minutes until golden brown. Use a slotted spoon to transfer churros to a paper towel-lined plate to drain excess oil. Combine sugar and cinnamon in a large bowl. 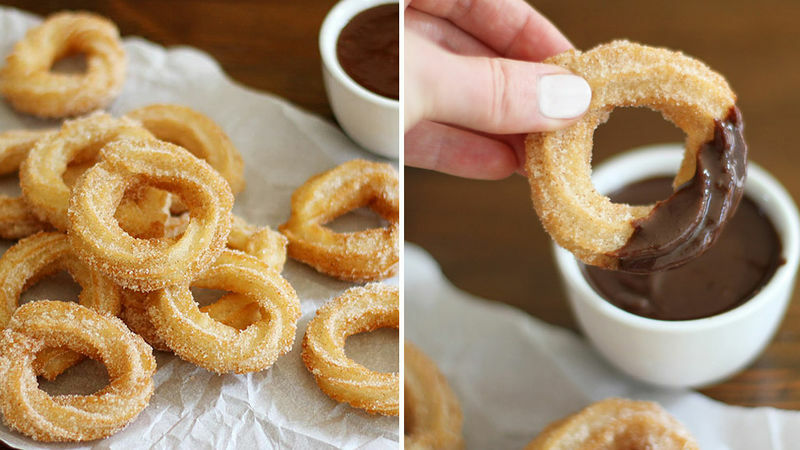 Add churros to bowl and toss lightly to coat. Serve churros warm with sauce on the side. Churros taste best the day they are made. You can pipe the batter into the oil in any shape you like: Rods, circles, ovals, Xs and Os, whatever! A quick batter turns into incredible deep-fried churros with a peanut butter and chocolate dipping sauce. It’s August, and in Minnesota-land that means only one thing (well, besides mosquitoes): the State Fair. And by the State Fair, I mean all the foods on a stick, deep-fried goodies and buckets, literally, of fresh-baked chocolate chip cookies. It’s a foodie’s/competitive eater’s paradise. Of course, not all of us have access to this annual festivity, which is why I’m here to save the day with a festival food treat you can make at home: Homemade Churros with Chocolate Peanut Butter Sauce. 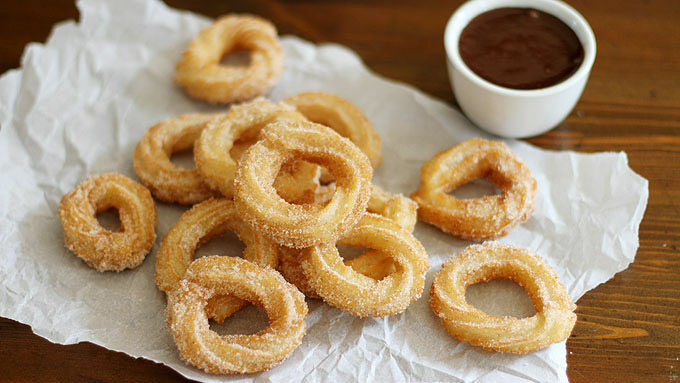 This churros recipe is adapted from The Novice Chef blog. You won’t believe how easy it is to make this delectable dessert in your own kitchen. And that sauce? Unreal. Get your gullets ready. You’ll probably have more sauce than you’ll use for dipping, so feel free to use the extra sauce to spoon on top of ice cream, waffles or directly into your face. You can pipe the churro batter directly into the oil, but for more accurate/pretty shapes, I suggest piping it onto a plate first, then transferring the dough that way into the oil. You can pipe the batter into any shape you like: Rods, circles, ovals, Xs and Os, whatever! Be sure to lower it into the oil with a slotted spoon – DO NOT plop it into the oil with your hands, that would be bad news bears. Toss the churros in cinnamon sugar (because YUM, that’s why) and serve them up warm with the chocolate-PB sauce on the side. Churros taste best the day they are made. Cue the choir of angels. And cue the State-Fair-fried-food-eating-but-at-home-ness. Or something. Anywayyyy, enjoy the churros, friends!